, an eminent prelate of the church of England, was the youngest son of the preceding Spencer second earl of Northampton, and born at Compton in 1632. Though he was but ten years old when his father was killed, yet he received an education suitable to his quality; and when he had gone through the grammarschools, was entered a nobleman of Queen’s college, Oxford, in 1649. He continued there till about 1652; and after having lived some little time with his mother, travelled into foreign countries. Upon the restoration of Charles II. he returned to England; and became a cornet in a regiment of horse, raised about that time for the king’s guard: but soon quitting that post, he dedicated himself to the service of the church; and accordingly went to Cambridge, where he was created M, A. Then entering into orders, when about thirty years of age, and obtaining a grant of the next vacant canonry of Christ church in Oxford, he was admitted canon-commoner of that college, in the beginning of 1666, by the advice of Dr. John Fell, then dean of the same. 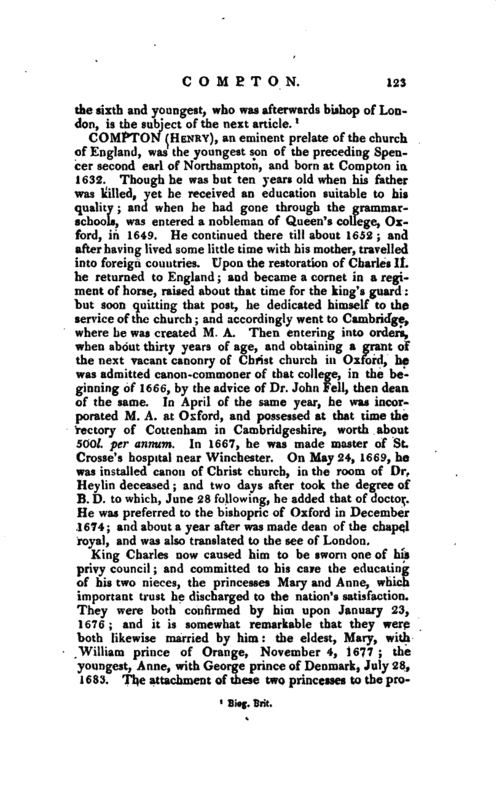 In April of the same year, he was incorporated M. A. at Oxford, and possessed at that time the rectory of Cottenham in Cambridgeshire, worth about 500l. per annum. In 1667, he was made master of St. Crosse’s hospital near Winchester. 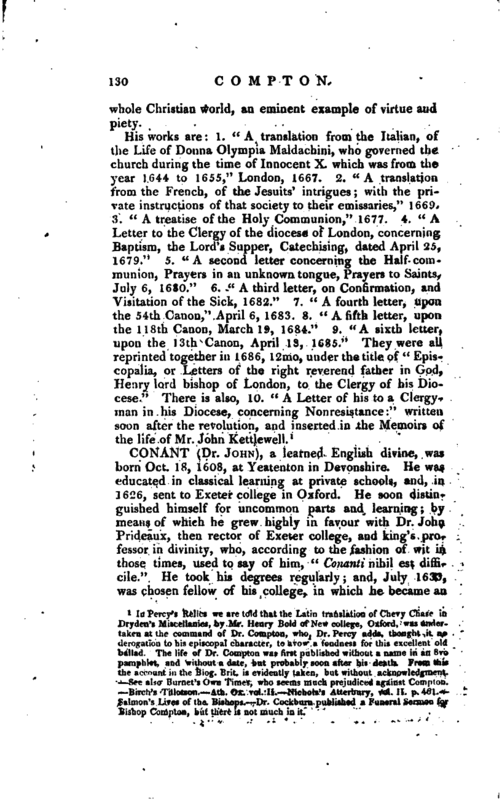 On May 24, 1669, he was installed canon of Christ church, in the room of Dr. Heylin deceased; and two days after took the degree of B. D. to which, June 28 following, he added that of doctor. He was preferred to the bishopric of Oxford in December 1674; and about a year after was made dean of the chapel royal, and was also translated to the see of London. King Charles now caused him to be sworn one of his privy council; and committed to his care the educating of his two nieces, the princesses Mary and Anne, which important trust he. discharged to the nation’s satisfaction. They were both confirmed by him upon January 23> 1676; and it is somewhat remarkable that they were both likewise married by him: the eldest, Mary, with William prince of Orange, November 4, 1677; the youngest, Anne, with George prince of Denmark, July 28, 1683. The attachment of these two princesses to the | protestant religion was owing, in a great measure, to their tutor Compton; which afterwards, when popery came to prevail at the court of England, was imputed to him as an unpardonable crime. In the mean time he indulged the hopeless project of bringing dissenters to a sense of the necessity of an union among protestants; to promote which, he held several conferences with his own clergy, the substance of which he published in July 16SO. He further hoped, that dissenters might be the more easily reconciled to the church, if the judgment of foreign divines should be produced against their needless separation: and for that purpose he wrote to M. le Moyne, professor ef divinity at Leyden, to M. de PAngle, one of the preachers of the protestant church at Charenton near Paris, and to M. Claude, another eminent French divine. Their answers are published at the end of bishop Stillingfleet’s “Unreasonableness of Separation,” 1681, 4to; all concurring in the vindication of the church of England from any errors in its doctrine, or unlawful impositions in its discipline, and therefore in condemning a separation from it as needless and uncharitable. But popery was what the bishop most strenuously opposed; and while it was gaining ground at the latter end of Charles the lid’s reign, under the influence of the duke of York, there was no method he left untried to stop its progress. This zeal was remembered and resented on the accession of James II. 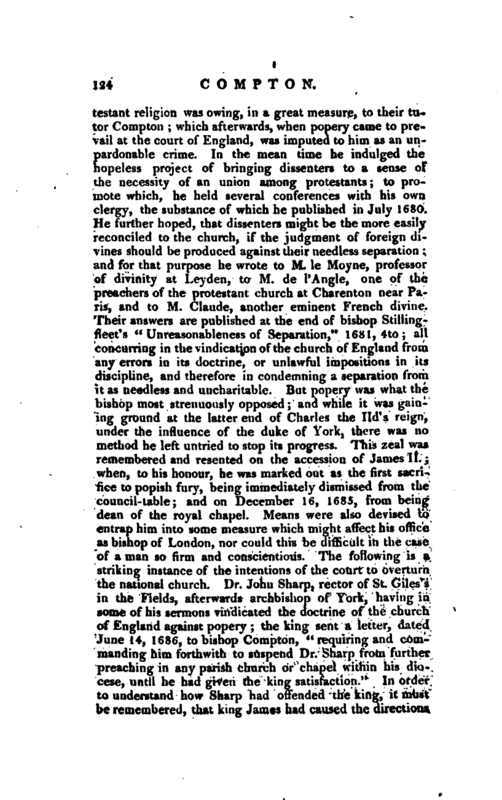 ; when, to his honour, he was marked out as the first sacrifice to popish fury, being immediately dismissed from the council-table; and on December 16, 1685, from being dean of the royal chapel. Means were also devised to entrap him into some measure which might affect his office as bishop of London, nor could this be difficult in the case of a man so firm and conscientious. The following is a striking instance of the intentions of the court to overturn the national church. Dr. John Sharp, rector of St, Giles’s in the Fields, afterwards archbishop of York, having in some of his sermons vindicated the doctrine of the church of England against popery; the king sent a letter, dated June 14, 1686, to bishop Compton, “requiring and commanding him forthwith to suspend Dr. Sharp from further preaching in any parish church or chapel within his diocese, until he had given the king satisfaction.” In order to understand how Sharp had offended the king, it must be remembered, that king James had caused the directions | concerning preachers, published in 1662, to be now reprinted; and reinforced them by a letter directed to the archbishops of Canterbury and York, given at Whitehall, March 5, 1686, to prohibit the preaching upon controversial points; that was, in effect, to forbid the preaching against popery, which Sharp had done. 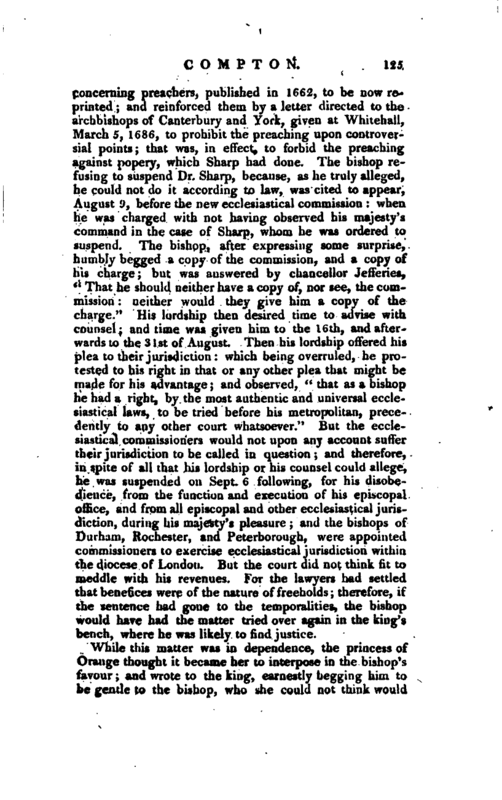 The bishop refusing to suspend Dr. Sharp, because, as he truly alleged, he could not do it according to law, was cited to appear, August y, before the new ecclesiastical commission: when he was charged with not having observed his majesty’s command in the case of Sharp, whom he was ordered to suspend. The bishop, after expressing some surprise, humbly begged a copy of the commission, and a copy of his charge; but was answered by chancellor Jefferies, “That he should neither have a copy of, nor see, the commission neither would they give him a copy of the charge.” His lordship then desired time to advise with counsel; and time was given him to the 16th, and afterwards to the 3 1st of August. Then his lordship offered his plea to their jurisdiction: which being overruled, he protested to his right in that or any other plea that might be made for his advantage; and observed, “that as a bishop he had a right, by the most authentic and universal ecclesiastical laws, to be tried before his metropolitan, precedently to any other court whatsoever.” But the ecclesiastical commissioners would not upon any account suffer their jurisdiction to be called in question; and therefore, in spite of all that his lordship or his counsel could allege, he was suspended on Sept. 6 following, for his disobedience, from the function and execution of his episcopal office, and from all episcopal and other ecclesiastical jurisdiction, during his majesty’s pleasure; and the bishops of Durham, Rochester, and Peterborough, were appointed commissioners to exercise ecclesiastical jurisdiction within, the diocese of London. But the court did not think fit to meddle with his revenues. For the lawyers had settled that benefices were of the nature of freeholds; therefore, if the sentence had gone to the temporalities, the bishop would have had the matter tried over again in the king’s bench, where he was likely to find justice. While this matter was in dependence, the princess of Orange thought it became her to interpose in the bishop’s favour; and wrote to the king, earnestly begging him to be gentle tp the bishop, who she could not think would | offend willingly. She also wrote to the bishop, expressing the great share she took in the trouble he was fallen into; as did also the prince. The king wrote an answer to the princess, reflecting severely on the bishop, not without some sharpness on her for meddling in such matters. The bishop in the mean time acquiesced in his sentence; but being suspended only as a bishop, and remaining still whole in his other capacities, he made another stand against the king, as one of the governors of the Charter-house, in refusing to admit one Andrew Popham, a papist, into the first pensioner’s place in that hospital. While he was thus sequestered from his episcopal office, he applied himself to the improvement of his garden at Fulham; and having a great genius -for botany, enriched it with a variety of curious plants, domestic and exotic*. 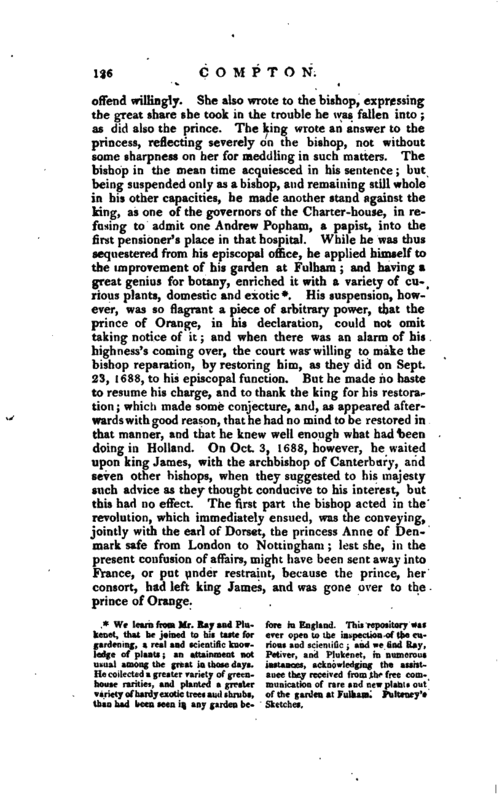 His suspension, however, was so flagrant a piece of arbitrary power, that the prince of Orange, in his declaration, could not omit taking notice of it; and when there was an alarm of his highness’s coming over, the court was willing to make the bishop reparation, by restoring him, as they did on Sept. 23, 1688, to his episcopal function. But he made no haste to resume his charge, and to thank the king for his restoration; which made some conjecture, and, as appeared afterwards with good reason, that he had no mind to be restored in that manner, and that he knew well enough what had been doing in Holland. On Oct. 3, 1688, however, he waited upon king James, with the archbishop of Canterbury, and seven other bishops, when they suggested to his majesty such advice as they thought conducive to his interest, but this had no effect. The first part the bishop acted in the revolution, which immediately ensued, was the conveying, jointly with the earl of Dorset, the princess Anne of Denmark safe from London to Nottingham; lest she, in the present confusion of affairs, might have been sent away into France, or put under restraint, because the prince, heir consort, had left king James, and was gone over to the prince of Orange. * We learn from Mr. Ray and Plu- fore in England. This repository was kenet, that he jwined to his taste for ever open to the inspection of the cugardening, a real and scientific know- rious and scientific and we find Ray, led^e of plants; an attainment not Petiver, and Plukenet, in numerous usual among the great in those days, instances, acknowledging the assistHe collected a greater variety of green- ance they received from the free cornhouse rarities, and planted a greater munication of rare and new plants out variety of hardy exotic trees and shrubs, of the garden at FulUam. Pulteaey‘5 than had been seen in any garden be* Sketches. | - At his return to London, he discovered his zeal for the revolution, and first set his hand to the association begun at Exeter. He waited on the prince of Orange, Dec. 21, at the head of his clergy; and, in their names and his own, thanked his highness fur his very great and hazardous undertaking for their deliverance, and the preservation of the protcstant religion, with the anc; ent laws and liberties of this nation. 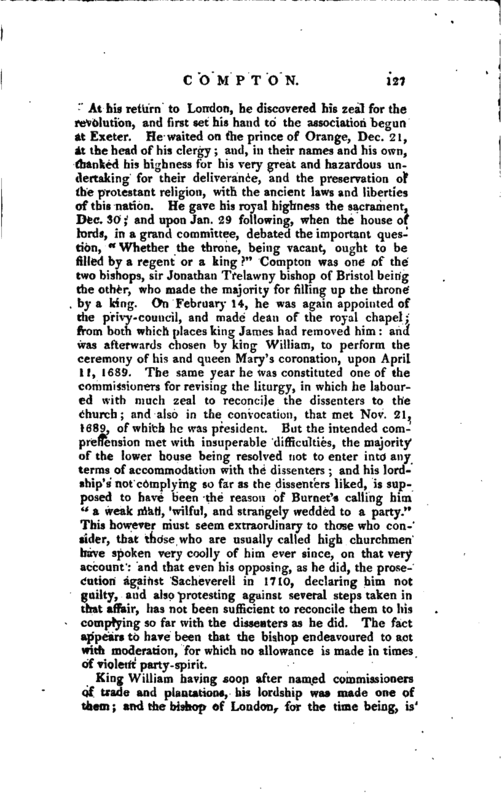 He gave his royal highness the sacrament, Dec. 30; and upon Jan. 29 following, when the house of lords, in a grand committee, debated the important question, “Whether the throne, being vacant, ou^ht to be filled by a regent or a king?” Compton was one of the two bisiiops, sir Jonathan Trelawny bishop of Bristol being the other, who made the majority for filling up the throne by a king. On February 14, he was again appointed of the privy-council, and made dean of the royal chapel; from both which places king James had removed him: and was afterwards chosen by king William, to perform the ceremony of his and queen Mary’s coronation, upon April 11, 1689. The same year he was constituted one of the commissioners for revising the liturgy, in which he laboured with much zeal to reconcile the dissenters to the church; and also in the convocation, that met Nov. 21, 1689, of which he was president. But the intended comprehension met with insuperable difficulties, the majority of the lower house being resolved not to enter into any terms of accommodation with the dissenters; and his lordship’s not complying so far as the dissenters liked, is supposed to have been the reason of Burnet’s calling him “a weak man, wilful, and strangely wedded to a party.” This however must seem extraordinary to those who consider, that those who are usually called high churchmen have spoken very coolly of him ever since, on that very account: and that even his opposing, as he did, the prosecution against Sacheverell in 1710, declaring him not guilty, and also protesting against several steps taken in that affair, has not been sufficient to reconcile them to his complying so far with the dissenters as he did. The fact appears to have been that the bishop endeavoured to act with moderation, for which no allowance is made in times of violent party- spirit. Among the many excellent features of his character given by Dr. Gooch, his munificence stands conspicuous. “He disposed of money to every one who could make out (and it was very easy to make that out to him) that he was a proper object of charity. He answered literally the apostle’s character, poor enough himself, yet making many rich. He had divers ancient people, men and women^ whom he supported by constant annual pensions; and several chiklren at school, at his own cost and charge, besides those educated from children, and brought up to the universities, to the sea, or to trades, &c. The poor of his parish were always attending his gate for their dole, and for the remains of his constant hospitable table, which was always furnished, and free to those whom respect or business drew to him. His hall was frequented in the morning with petitioners of all sorts. More particularly, he spared no cost nor pains to serve the church and clergy. He bought many advowsons out of lay-hands. He gave great sums for the rebuilding of churches, and greater still for the buying in impropriations, and settling them on the poor vicars. There was no poor honest clergyman, or his widow, in want, but had his benevolence when applied for: not any in the reformed churches abroad, to whom he was not a liberal patron, steward, and perpetual solicitor for. The French refugees drank deep of his bounty for many years; so did the Irish in their day of affliction and likewise the Scotch episcopal party,” when ejected from their livings at the revolution. It may truly ’be said, that by his death the church lost an excellent bishop; the kingdom a consistent and able statesman; the protestant religion, at home and abroad, an ornament and refuge; and the | whole Christian world, an eminent example of virtue and piety. In Percy’s Relics we are told that the Latin translation of Chevy Chase in Dryden’s Miscellanies, by Mr. Henry Bold of New college, Oxford, was undertaken at the command of Dr. Compton, who, Dr. Percy adds, thought it no derogation to his episcopal character, to avow a fondness for this excellent old ballad. The life of Dr. Compton was first published without a name in an 8vo pamphlet, and without a date, but probably soon after his death. Frem this the account in the Biog. Brit, is evidently taken, but without acknowledgment. 'See also Burst’s Own Times, wha-seems much prejudiced against Compton. Birch’s Tillotson. Ath.Ox.Tol.lt. Nichols’s Atterbury, vol. II. p. 461. 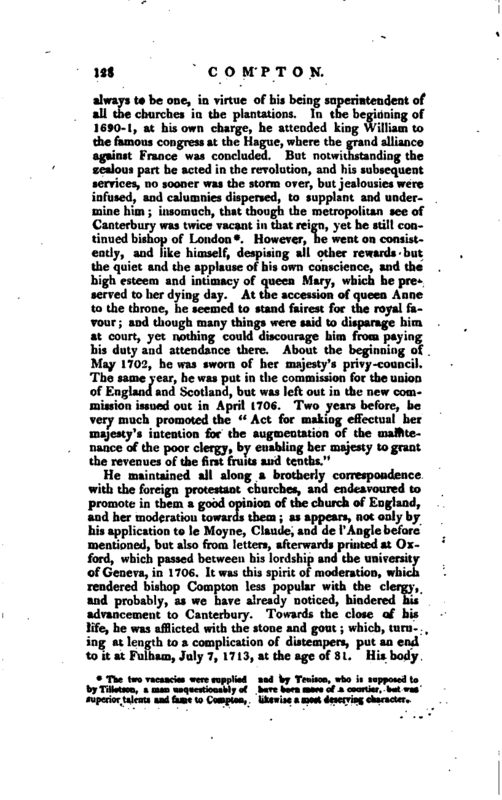 Salmon’s Lives of the Bishops. 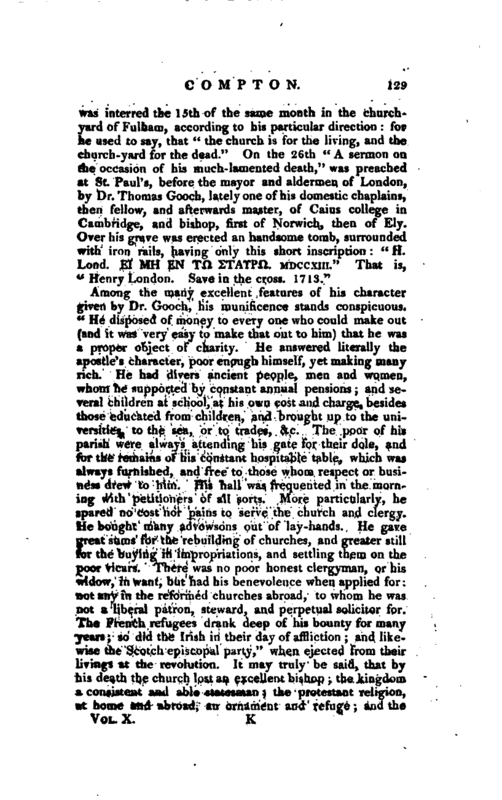 Dr. Cockburu published a Funeral Sermon for Bishop Compton, but there is not much in. it.